2015: Where did you go? I cannot believe that 2015 is now done and dusted. Doesn’t it seem that the older we get, the faster time goes? I really try my hardest to slow down and live in the moment but still, time just keeps flying by. We have been here in South Africa for over 2 years now. The first year we were really in transition mode; getting settled in a new country, making new friends, and me, starting a new job. The biggest change back in 2014 was that the Frenchie became the “trailing spouse” as he was not allowed to work while on my visa. 2015 saw us get back to a bit of normalcy in our lives. Late in 2014 the Frenchie was able to secure his own work permit and left his trailing spouse role for a paid position in the South African work force. Our household roles were redistributed and I found myself slaving away in the kitchen much more often (haha, not really, but we have started eating out a lot more lately). When I look back at 2015, it seems I have been away more than I have been home. I haven’t added up the time, but I am sure it is not all that far off. I traveled quite a bit for business and pleasure and at times, there would be luggage from more than one trip lying on the bedroom floor waiting to be unpacked. I started to go back and look through my photos to remind me just what I have been up to this year and I thought it might be fun to post a recap of where I have been month by month. Some trips I have already blogged about and others not as I sometimes just didn’t have the time. Let’s have a look. The new year started off calmly enough. I didn’t have any trips outside of Joburg in January and that gave us a chance to spend some time in this fabulous city we are proud to call home. One of the reasons I love Joburg so much is due to its diversity. You can really find just about anything here. Two of the things we did in January I think illustrate this quite nicely: a visit to the Norscot Koppies Nature Reserve (a lovely reserve right in Joburg that I wrote about here in 2014) and a walk through Cyrildene, the new Chinatown of Joburg (you can see more photos from our first visit here). 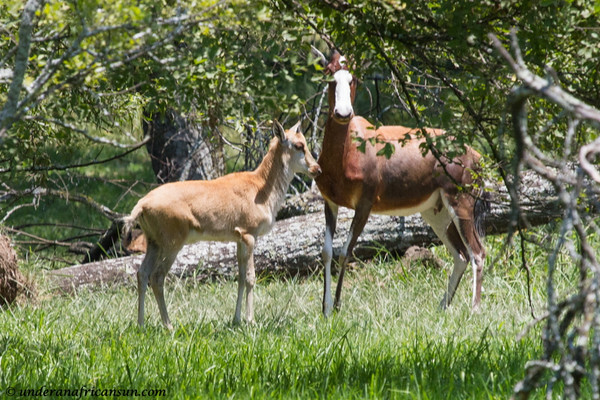 This trip to Norscot was specifically to photograph this baby blesbok, isn’t he sweet? 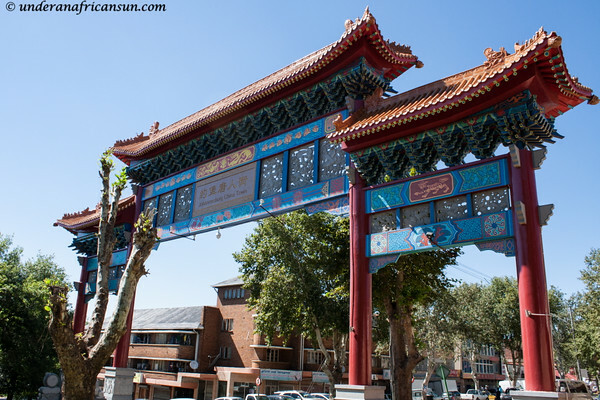 Cyrildene, the new Chinatown of Joburg. Don’t bother with the strip mall Chinese takeout joints, just come here. February was a great month for me. Due to the Frenchie’s new job, I took my first solo trip to Kruger National Park. Just a few months prior to this trip, I would have never imagined myself driving around Kruger on my own and yet, there I was. It was an awesome adventure and it cemented the idea that I am truly addicted to the Kruger. I wrote a couple of other blog posts about this trip here and here. The tempo really started picking up in March. Just after I returned from Kruger, we had a couple of the Frenchie’s ex-coworkers visiting from France and we took them to Pilanesberg National Park for a weekend. 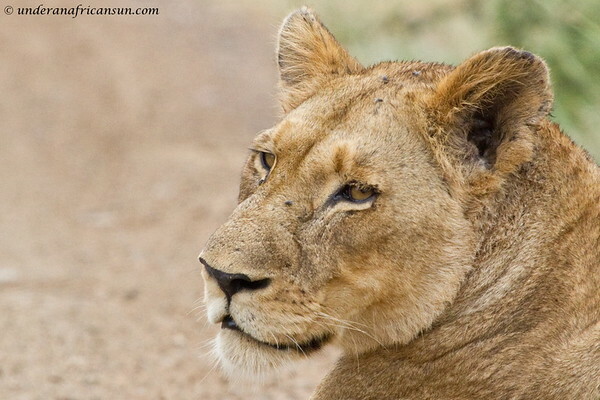 I didn’t get a chance to write about this trip (you can see a previous post I did about Pilanesberg here) but we had a great time, the highlight being a large pride of lions with many cubs. A tender moment between father and cub. 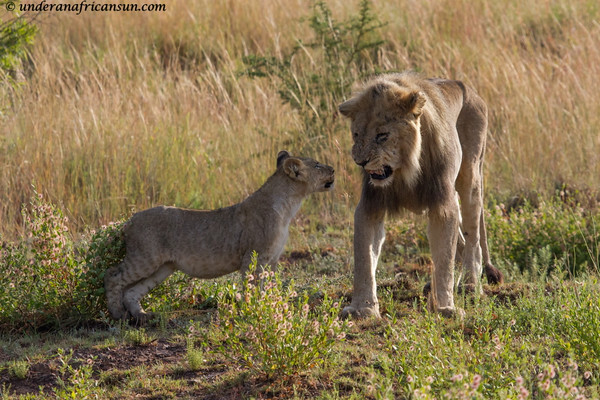 This elderly male lion was trailing behind the rest of the pride and this cub hung back to see if his father was coming. We were told this male was at the end of his (long) life, however I was happy to see sightings of this male posted a couple of months ago. March also marked the first of 3 trips I made back to France for work in 2015. 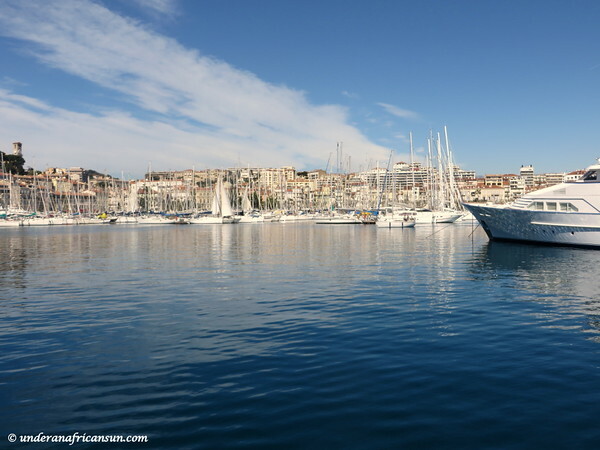 This trip I was based in Cannes with my clients from all over Central and West Africa. It was a crazy but fun week and really gave me a lot of insight into the cultural differences and challenges across this region. I managed to post some photos here. No sooner did I return from France and it was time for Easter break. 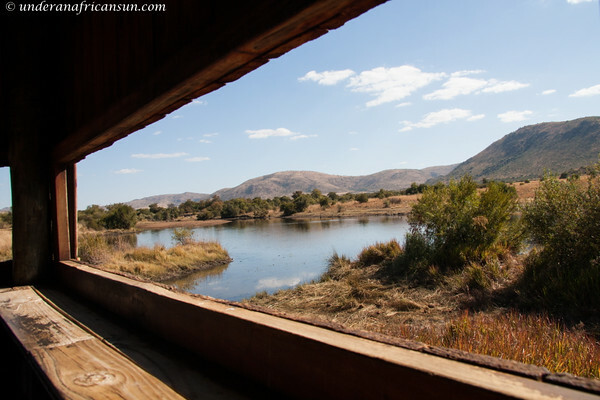 We wanted to take full advantage of having some time off together so we headed to Swaziland to Mlilwane Wildlife Sanctuary, a place we had visited back in 2014. Mlilwane is so very special and we were happy to return. Last time we camped but this time we stayed in the very unique beehive huts which are huge and very comfortable. 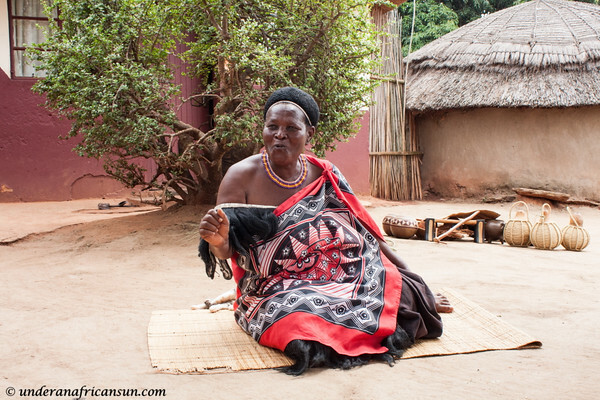 One morning we visited a Swazi Village just outside of Mlilwane. While this was quite touristy, there were lots of good photo ops and we bought some really nice traditional crafts. This is the chief of the village. Next up was a week in Dakar, Senegal for business. I had visited Senegal back in Sept 2001 and I was excited to return. Most of the trip was work, but I did have a bit of free time and my colleagues were happy to show off their city. Since the headquarters of my region is based in Dakar, there will likely be many more trips there in my future. 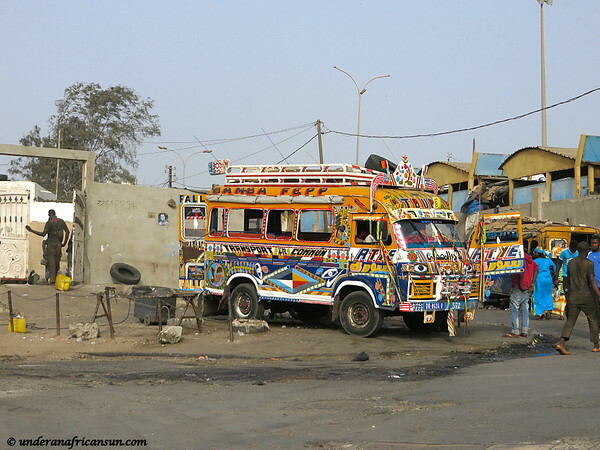 Car rapide, a traditional form of public transport in Senegal. I will not leave Dakar the next time without a ride in one of these. April was not yet over. At the end of the month, I made my first of several business trips this year to Gaborone, Botswana. I was pretty excited to visit as this was the only new country stamp in my passport for 2015. That excitement didn’t last very long as I soon found out the capital, Gaborone, is unfortunately not all that interesting. Maybe 2016 will be the year I get to Chobe National Park or the Okavango Delta but I am pretty sure a couple more trips to Gaborone are also in the works for me. Gaborone Main Mall. 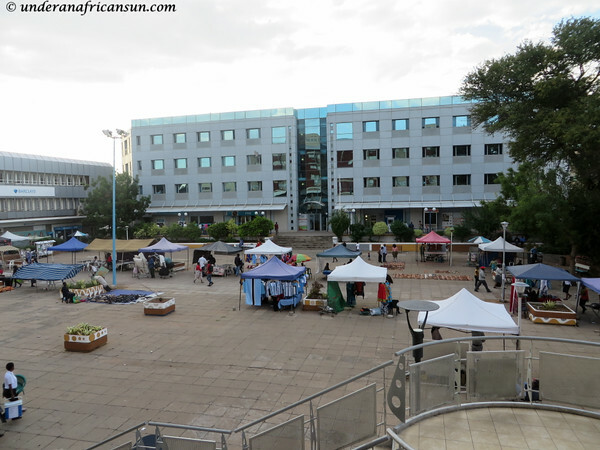 A colleague from France and I had a free afternoon to explore and ended up at the “Main Mall”. There wasn’t too much here but we bought a couple crafts and had some lunch. May did not slow down and a long weekend found us at Lionsrock Big Cat Sanctuary. This trip was amazing for some many reasons. I don’t want to repeat myself so please go read about the work they are doing on my blog post I wrote. And please, if you ever feel the urge to cuddle lion cubs, please read here and here why that is a terrible idea. One of the highlights for me in 2015 was a work trip to Istanbul. I attended a conference for a few days and then I spent 3 more days on my own to sightsee. Istanbul explodes with photo ops and unfortunately I never got around to blogging about it, maybe I will still do that one day. 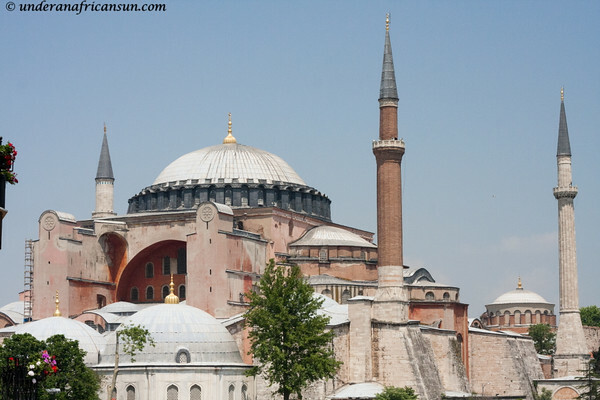 Hagia Sophia as seen from the rooftop of my hotel. On the other side was the Blue Mosque. I was fortunate to be on the roof at Friday noon when the call to prayer sounded from both, creating a magical symphony of echos and a very special memory for me. The day after my return from Istanbul I was back in Gaborone once again. I’m pretty sure I didn’t even take any photos. By June we were both pretty exhausted but made some time for another weekend away at Pilanesberg. This was unfortunately the lowlight of my travel year as our camp neighbors were totally drunk and loud all weekend and there was no hope for a restful weekend away in the bush, though we did have some nice wildlife sightings. July is my birthday month and it is our tradition to get away for a few days and just spend time together. 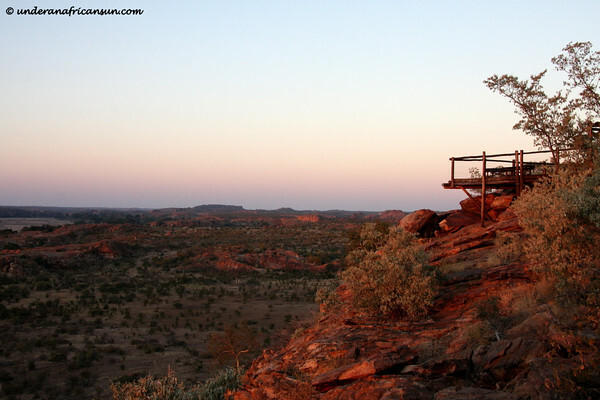 This year we spent a long weekend at Mapungubwe National Park in the far north of South Africa. This was the first time we had visited this lesser known park but it was incredibly scenic and I highly recommend a visit. You can read more about this one on the blog post I wrote about our visit. During the later part of the month, I spent 2 weeks back in Nice for work. France was experiencing a horrible heatwave and I actually started missing the South African winter. 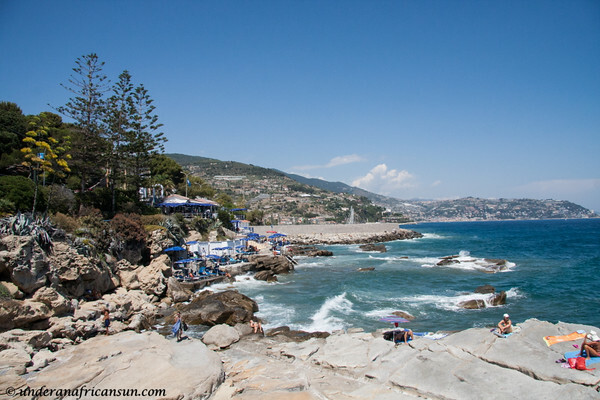 I also got a chance to head across the border to a small beach town in Italy called Bordighera for a weekend. 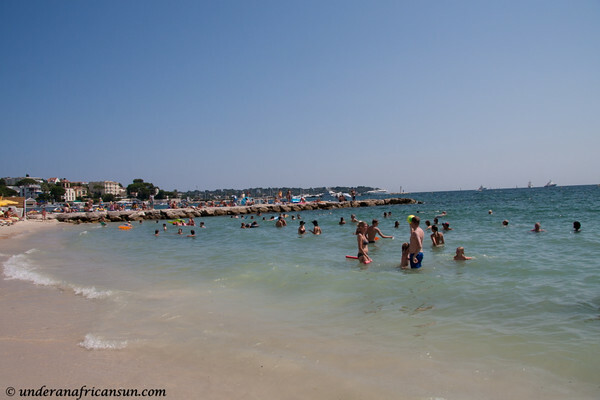 This was the perfect place to get out of the Côte d’Azur summer chaos for a more relaxed weekend and to enjoy some great italian food as well. A long holiday weekend was just enough time for a quick getaway to Kruger National Park for a too short 2 night stay. 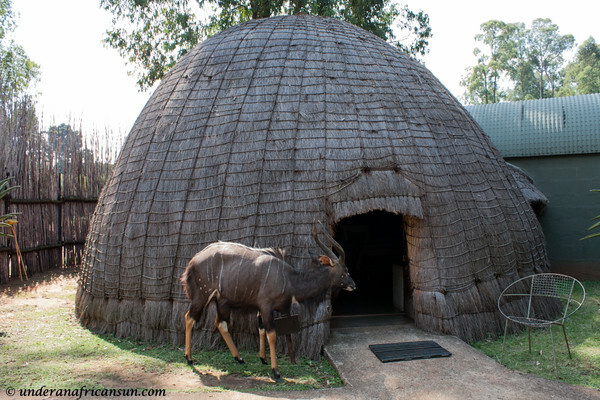 We usually avoid the park over holidays as it can get very crowded but we found an opening at Mopani Rest Camp in the north of the park and we were pleasantly surprised to find hardly any other vehicles on the roads up there. 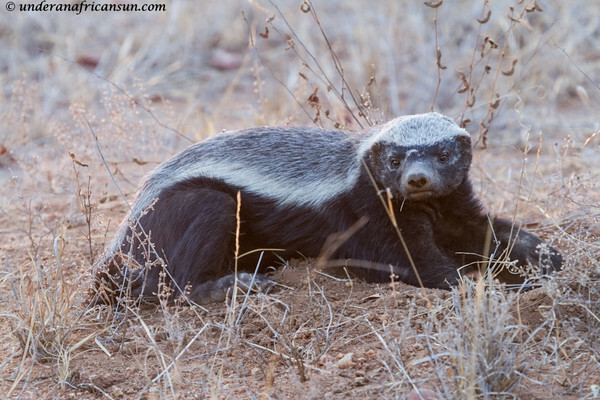 We were fortunate to have some fantastic sightings including cheetah and one of my favorites, a honey badger. We were also seriously mock charged by a cranky elephant, an experience that I am not eager to have again any time soon. 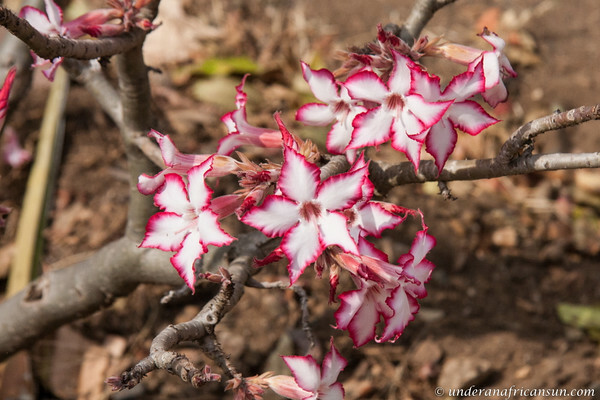 It was our first visit to Kruger in the winter and one of the best surprises of the trip were these beautiful impala lilies blooming all over the park. I loved them so much that I bought a seedling to take home. I have now learned that it takes 5-6 years to bloom so I guess that gives me something to look forward to. Check back in 2020 with me. 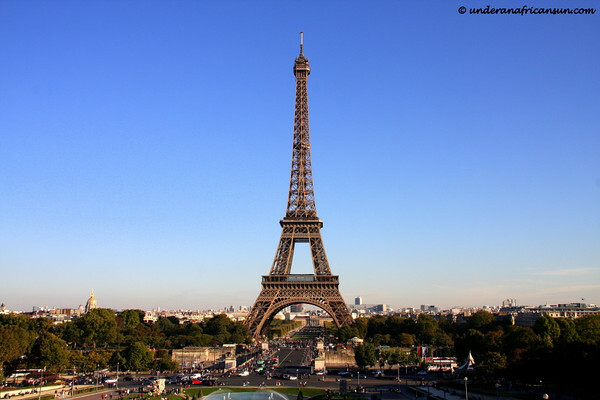 At the end of September, I went to Paris for 2 weeks to renew my South African work visa. I used to live in Paris and I was so happy to get back to a city that I love and reconnect with so many good friends. I was working from our office there but every free moment I had was spent out and about in the city, no time for resting when you are in Paris! 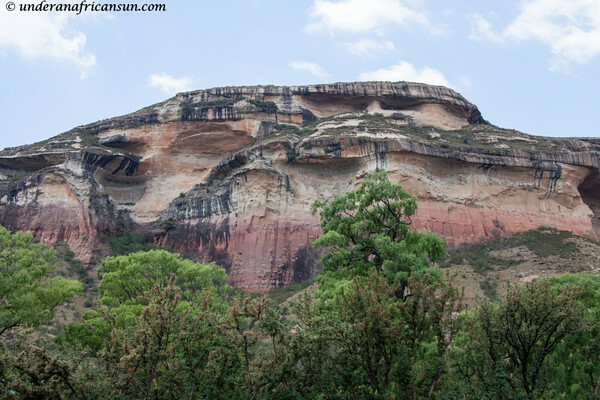 Upon my return from Paris, we headed south for a weekend away in the Golden Gate Highlands National Park. This place has got to be one of the most scenic in all of South Africa. It wasn’t our first visit to this magical place and it certainly won’t be the last. 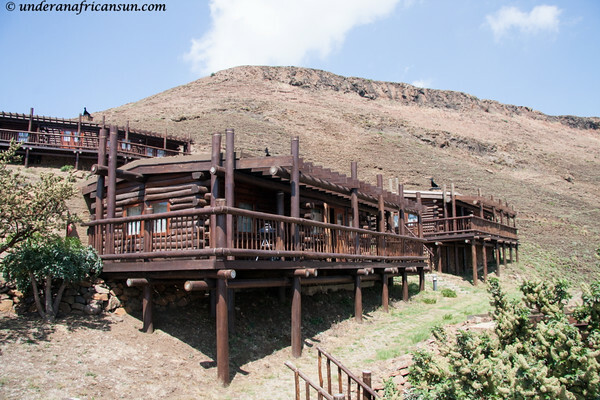 This time we stayed at Highlands Mountain Retreat in a log cabin way up in the mountains with the best view ever and a cozy fireplace to keep us warm. The absolute best thing about this time of year is the blooming Jacarandas which are found all over Joburg. 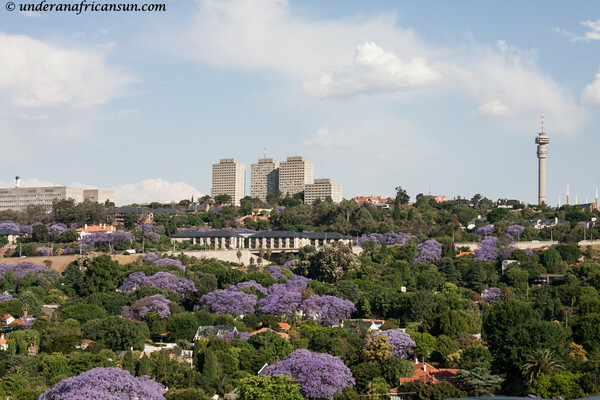 We didn’t make it to Pretoria this year (aka Jacaranda City) but we did find time for several drives around Joburg to photograph these purple beauties. Jacarandas as seen from Four Seasons the Westcliff Hotel, one of the best views in the city. November started with one last trip to Gaborone for the year, but the highlight was my second solo trip to Kruger National Park. It is hard to believe, but each trip just gets more and more exciting. I have already written a post about my Leopard Encounter and another about the cute Kruger Babies found all over the park this time of year. I have a couple more posts in the works so stay tuned. December was spent in Jozi and I can’t say that I really minded after a long year of travel. Summer arrived in full force with scorching temperatures throughout most of the month. Regardless, I was happy to hang out at home a bit and also get out to see some local sights. 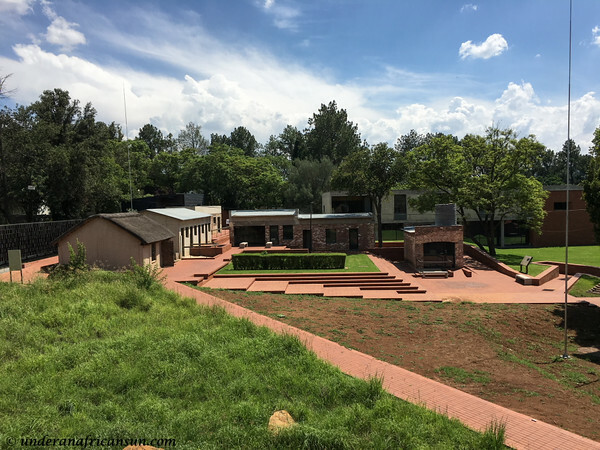 I finally got around to visiting Liliesleaf Farm, the former headquarters of the underground movement during apartheid in the early 1960’s. I can’t believe I waited so long to visit here, it is so well done with a ton of fascinating information, a must visit. 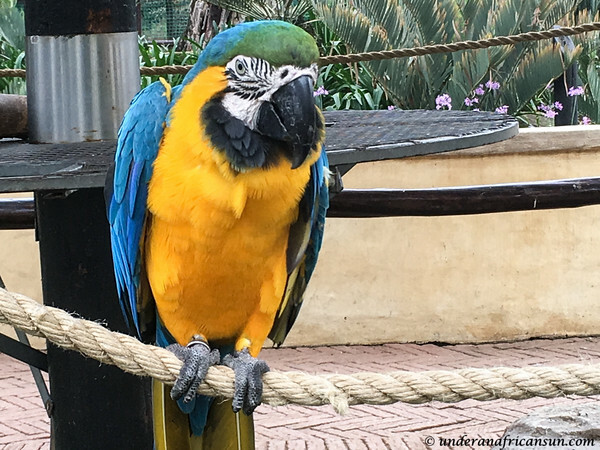 Another terrific place to visit is just down the street from me, the Bird Gardens in the Montecasino complex. I have been here several times and it is always a ton of fun. There are many wonderful birds but also other animals such as meercats and free-roaming lemurs. And on that note, 2015 is a wrap. It is a little hard to believe, but I currently have no (zero, none) trips planned in 2016. Well, that isn’t completely true as I have many ideas bobbing around in my head that are just dying to get out so I am sure I won’t be sitting around relaxing too long. Thanks to all of you following the blog this year, I hope you and yours have a happy and healthy 2016. 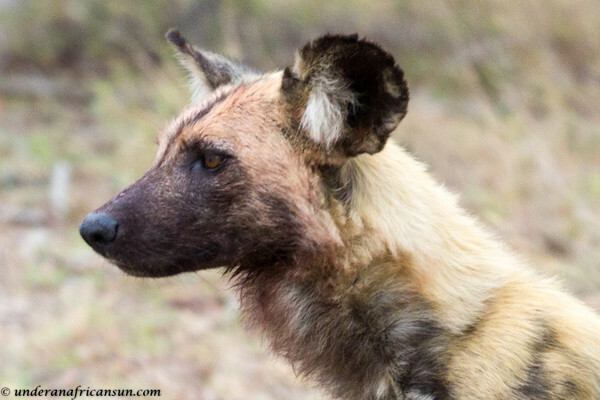 This entry was posted in Europe, Johannesburg, Safari, South Africa, Swaziland, Wildlife and tagged France, Johannesburg, Kruger, Pilanesberg, Reserves, Safari, South Africa, Swaziland, Wildlife by UnderAnAfricanSun. Bookmark the permalink. 2015 was a great year I can see! Hope that 2016 is even better 🙂 Have a great year! Merci Mary! Hope to see you in 2016, maybe here ? Bisous. You had an amazing 2015, Kelly! 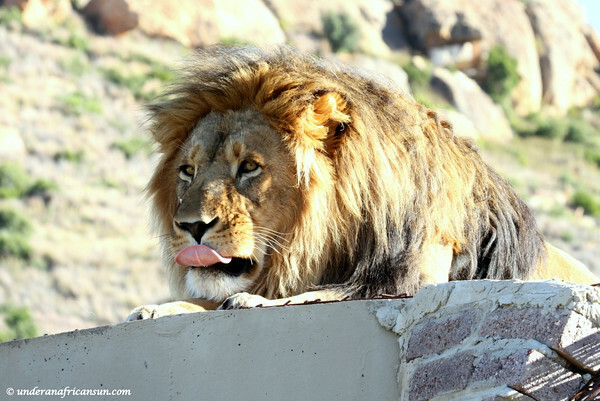 Here’s hoping that 2016 will treat you just as kindly (with fewer drunken campers in Pilanesberg)! Thanks so much! I hope 2016 is a great one for you too, I look forward to your adventures! I was in Chobe earlier this week (only for a day, unfortunately) and had the most amazing wildlife sighting. Will write about it in a few days. You’ve got to go there – you’ll love it! Thanks Heather. I can.not.wait. to hear about Chobe! Happy New Year to you and Ray! Thanks so much, so kind of you to comment ! I think it’s because i’m a fellow cancerian that’s why i commented Lol!